NACOGDOCHES, Texas - Stephen F. Austin State University honored two faculty members and several prominent donors during the 30th annual SFA Gala Saturday, Dec. 8, in the Baker Pattillo Student Center Grand Ballroom. 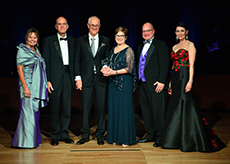 "This year's Gala honorees have significantly impacted the lives of students and the campus community through their generous contributions," said Jill Still, SFA vice president for university advancement. "We are pleased to recognize their generosity, as well as faculty members whose dedication to teaching and research establishes an accomplished university community." Donors honored this year include Lou Ann Richardson, Walter "Loddie" Naymola, and Dr. Cindy and Kurt Kalkomey. Recognized for supporting the areas of business and athletics, Lou Ann Richardson of Dallas has a long history of involvement with SFA. This fall, a collaborative classroom on the first floor of the McGee Business Building on the SFA campus was named in her honor. Currently, Richardson is a Wells Fargo executive vice president and head of relationship programs for wholesale relationship strategies and insights. She remains an active member of the SFA community by participating in the Rusche College of Business Executive Advisory Board. 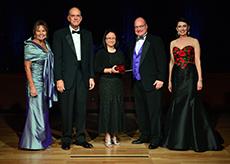 In 2014, the SFA Alumni Association named her a distinguished alumna. She became a life member of the association in 1992. 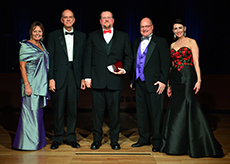 Richardson was inducted into SFA's Fredonia Society. Former student-athlete Walter "Loddie" Naymola graduated from SFA in 1979, earning a Bachelor of Business Administration with an emphasis in finance. Soon after, he launched what would become a decades-long career as an entrepreneur by founding Service Pump and Compressor in 1984. In that role, Naymola pioneered an unprecedented rate of expansion by establishing a network of 15 branches. Since 1984, Naymola has founded, acquired and scaled more than 100 businesses. He has sold primarily start-up businesses totaling more than $1.2 billion in transactional value to date. In addition to his portfolio of business ventures through numerous industries, Naymola founded a private investment firm specializing in equipment rental. In 2014, Naymola established the Naymola Foundation to champion philanthropic efforts in support of various universities, medical research and children advocacy programs. Through this foundation, he has provided support to several SFA initiatives, most notably in the business and athletics areas. An innovation hub on the third floor of the McGee Business Building on the SFA campus was named in Naymola's honor earlier this year. While at SFA, Naymola was a member of the Phi Delta Theta fraternity. His son, Zane, currently attends SFA. His daughter, Madison, lives in Beaumont with her husband. Naymola was inducted into SFA's Thomas J. Rusk Society. The Kalkomeys' connection to SFA stretches back to the 1970s when both Cindy and Kurt began attending the university. Cindy graduated in 1977 and Kurt the next year, both earning a Bachelor of Science with emphases in mathematics/statistics and biology, respectively. They stayed to each pursue a Master of Science and graduated together in 1979. The Kalkomeys are both proud Lumberjacks and carried their outdoors-loving spirit into their professional lives by founding a company that focuses on outdoor safety. Kalkomey Enterprises offers online courses and print products for boating, hunting, bowhunting, off-road, handgun and snowmobile education. With a professional life focused on education, it is fitting that, in their personal life, the Kalkomeys chose to endow a scholarship that would completely cover the cost of a student's education at SFA. They attribute the creation of the Kalkomey Scholarship to the positive influence they each received from the late Dr. Jack McCullough, former faculty member in SFA's Department of Biology and director of the environmental science graduate studies program, and the late Dr. Jasper Adams, former faculty member and chair of SFA's Department of Mathematics and Statistics. The Kalkomeys were inducted into SFA's Thomas J. Rusk Society. Faculty member awards presented during the Gala recognize innovation and excellence in teaching and research. Dr. Sheryll Jerez, associate professor of environmental science in the Arthur Temple College of Forestry and Agriculture, received the 2018 Faculty Achievement Award for Teaching. Jerez received her doctoral degree in agricultural engineering in 2007 from the University of Illinois at Urbana-Champaign and began teaching at SFA as an assistant professor of environmental science. She was awarded Faculty Mentor of the Year in 2014, the Kenneth Watterston Teaching Excellence Award in 2016 and was a finalist for the SFASU Foundation Faculty Achievement Award for Teaching in 2016 and 2017. "SFA's environmental science program is rated among the top 50 in the nation," said Dr. Hans Williams, dean of the Arthur Temple College of Forestry and Agriculture. "Our philosophy is to produce graduates who are problem-solvers. Dr. Jerez's quality teaching and breadth of course offerings are solid contributors to the success of our program." Dr. Kevin Stafford, associate professor in SFA's Department of Geology in the College of Sciences and Mathematics, received the 2018 Faculty Achievement Award for Research. Stafford began teaching geology at SFA in 2008, after receiving his doctoral degree from New Mexico Institute of Mining and Technology. According to Dr. Wesley Brown, chair of SFA's Department of Geology, Stafford is recognized as the foremost authority on evaporite karst hydrogeology within West Texas and Eastern New Mexico, and he is one of the lead authorities on hypogene karst development within the Western hemisphere. "Dr. Stafford masterfully combines his broad-based understanding of geology with his research interests, engaging students in the discipline and supporting their research interests while maintaining a stellar research agenda himself," said Dr. Kimberly Childs, dean of the College of Sciences and Mathematics at SFA. "He has been an important catalyst and defining voice within the Department of Geology and the College of Sciences and Mathematics in the area of research. He consistently maintains strong ethical standards." Pictured, from left, are Brigettee Henderson, chair of the SFA Board of Regents; Dr. Steve Westbrook, SFA acting president; Lou Ann Richardson, donor and Fredonia Society inductee; Jimmy Mize, SFASU Foundation chairman; and Jill Still, vice president for university advancement. Pictured, from left, are Brigettee Henderson, chair of the SFA Board of Regents; Dr. Steve Westbrook, SFA acting president; Walter E. "Loddie" Naymola, donor and Thomas J. Rusk Society inductee; Jimmy Mize, SFASU Foundation chairman; and Jill Still, vice president for university advancement. 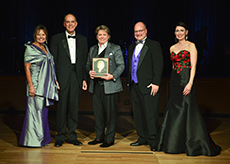 Pictured, from left, are Brigettee Henderson, chair of the SFA Board of Regents; Dr. Steve Westbrook, SFA acting president; Kurt and Cindy Kalkomey, donors and Thomas J. Rusk Society inductees; Jimmy Mize, SFASU Foundation chairman; and Jill Still, vice president for university advancement. 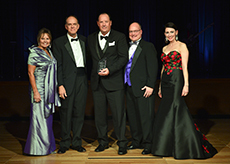 Pictured, from left, are Brigettee Henderson, chair of the SFA Board of Regents; Dr. Steve Westbrook, SFA acting president; Dr. Sheryll Jerez, recipient of the 2018 Faculty Achievement Award for Teaching and associate professor of environmental science; Jimmy Mize, SFASU Foundation chairman; and Jill Still, vice president for university advancement. Pictured, from left, are Brigettee Henderson, chair of the SFA Board of Regents; Dr. Steve Westbrook, SFA acting president; Dr. Kevin W. Stafford, recipient of the 2018 Faculty Achievement Award for Research and associate professor in SFA's Department of Geology; Jimmy Mize, SFASU Foundation chairman; and Jill Still, vice president for university advancement.